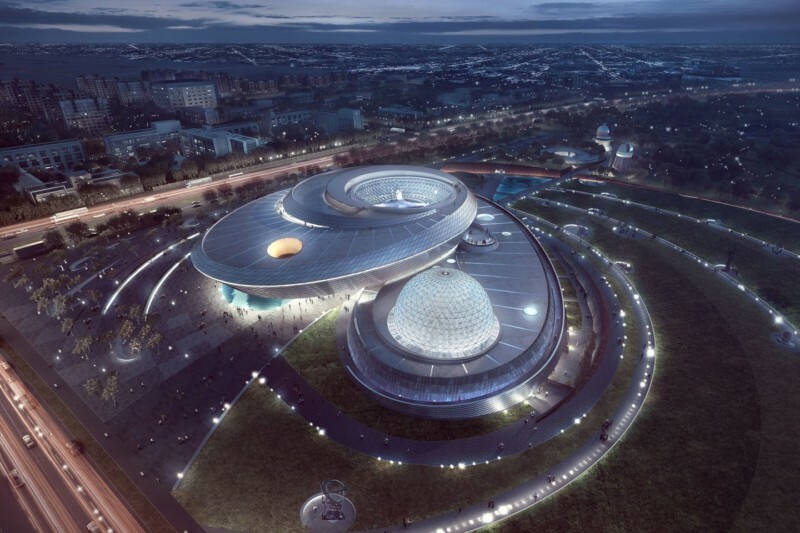 The international competition-winning design of the Shanghai Planetarium celebrates the continuum of time and space: it is modern and forward-looking while at the same time presents a link to the past, mirroring both the rich history of Chinese astronomy and the future ambitions of China’s space exploration program. In linking the new Museum to both scientific purpose and to the celestial references of buildings throughout history, the exhibits and architecture will communicate more than scientific content: they will illuminate what it means to be human in a vast and largely unknown universe. The building form, program and circulation support the flow of visitors through the galleries and the experience of the three central bodies. Set within an expansive green zone, the Museum grounds include exterior exhibits, including a seventy-eight-foot-high solar telescope, as well as evening activities at a Youth Observation Camp and Observatory. The Museum will elevate scientific and technological capacity while redefining the Langang area, about forty-five minutes from downtown Shanghai.